Gliding shelves make access to expensive and heavy machinery tools and die a safer, more ergonomic activity with 100% extendable shelves. Equipment can be lifted overhead for safe, careful transport, minimizing manual handling needed. Crank-Out storage racks provide versatile, heavy-duty shelving that extends out to 75% so that items can be easily loaded and unloaded with an overhead crane or forklift. Each level has a capacity of 5,000 lbs. and a cranking handle point at an ergonomic height. 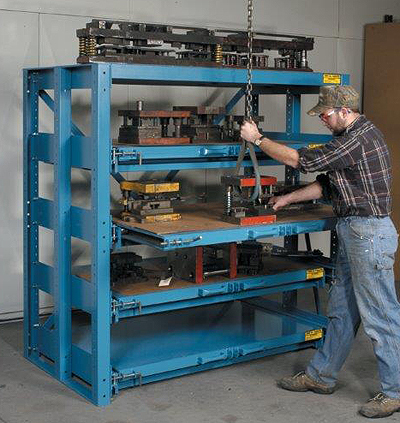 Roll-out shelf racks provide storage for large, heavy stock materials such as tooling, die, and parts. Machining, fabrication and assembly are greatly accelerated by the ease of access from being able to fully extend the shelves.